Can't see your query answered? Contact us and we'll respond within 24 hours. Q. What is a vintage NASA photograph? A. 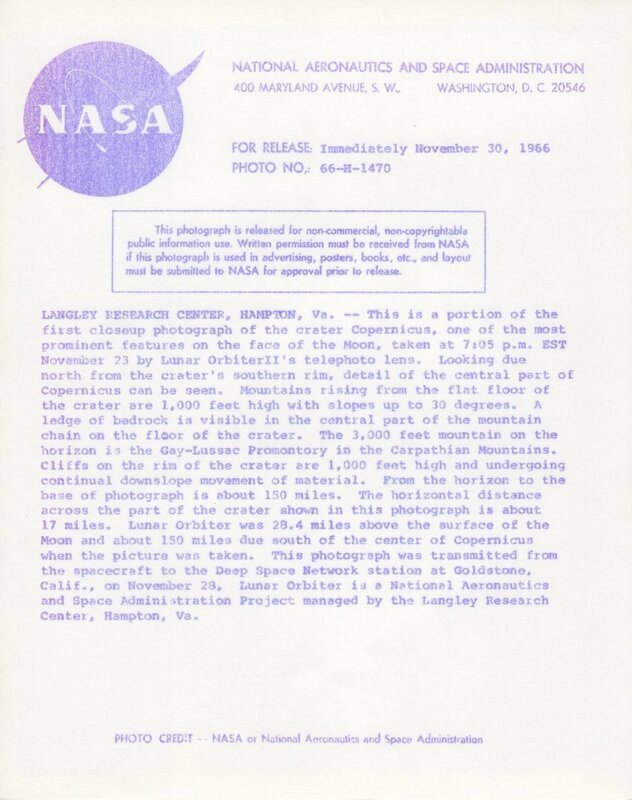 The photographs on this website are guaranteed as vintage NASA prints, processed by NASA’s photographic laboratories shortly after the date of the scene depicted. As contemporary, original prints of pictures taken by astronaut-photographers such as Neil Armstrong, they are very rare and difficult to find, especially in good condition. 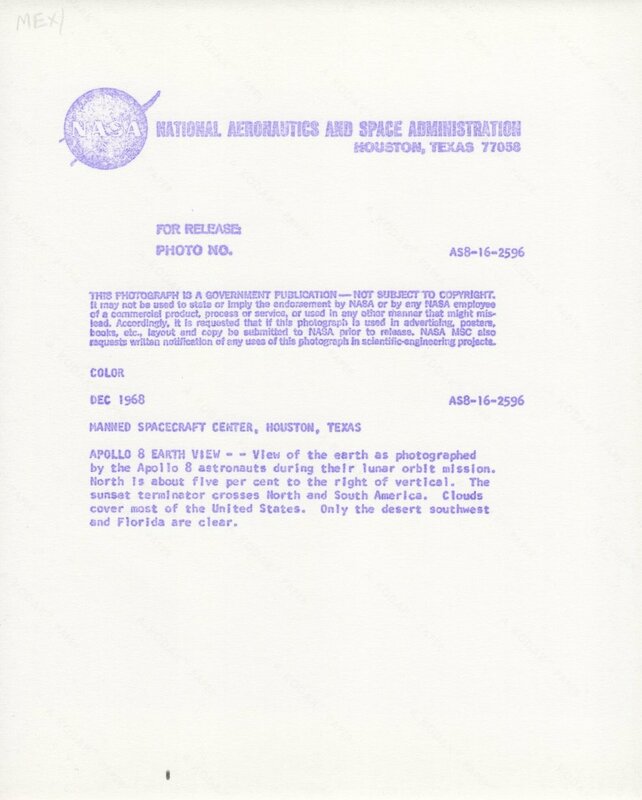 Generally speaking, vintage NASA photographs were printed on fibre-based photographic paper, 20 x 25 cm (8 x 10 in). Most are printed on “A Kodak Paper”, a watermark which changed in 1972. Unless otherwise stated, all photographs are glossy prints on paper. The NASA reference numbers within square brackets do not appear on the prints and are provided for reference. Individual condition reports are available upon request, but all photographs are sold as seen. Prices exclude framing. Q. How many of them are there? A. NASA produced master duplicates of all negatives after each mission, while the originals were locked away in cold store. 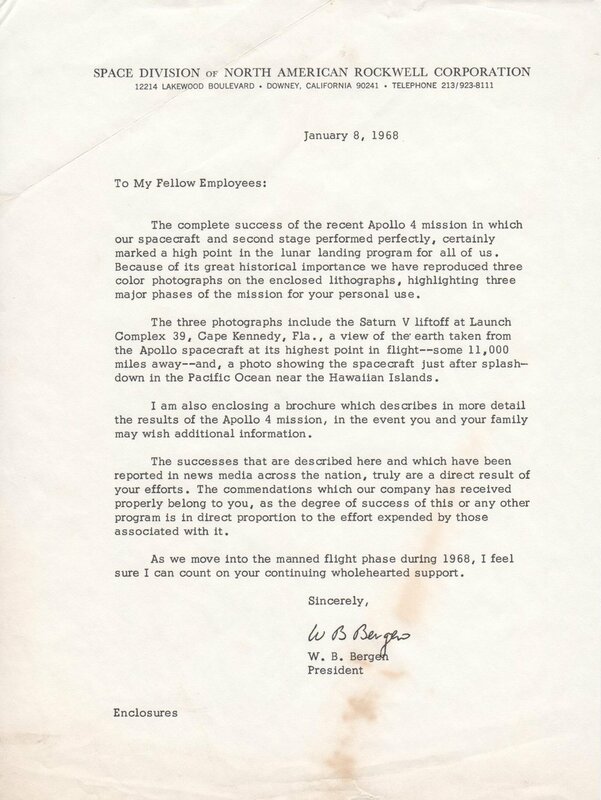 From the master duplicates photographs were printed and distributed for the use of NASA’s own scientists and public relations department. In subsequent years, NASA destroyed many of these original prints as they were archived on the internet and true vintage prints are subsequently hard to find. Vintage NASA photographs are not ‘editioned’ in any conventional sense, and there is an unknown but certainly finite number of them in open circulation. Q. How do these differ from photographs signed by NASA astronauts or other space memorabilia? A. Most, if not all, signed photographs are very recent prints or copies, not vintage. In our eyes the presence of a signature on the face of a vintage photograph would also reduce both its financial and aesthetic value. Q. What is a large-format vintage NASA photograph? A. Vintage large-format photographs were typically printed for scientists or for presentation to visiting dignitaries. They rarely appear on the market and come in a variety of sizes. Q. What are the red (or black/blue) NASA numbers? A. These typically refer to the mission name or number, such as AS15 for Apollo 15, the magazine number and frame number. The majority of prints have a red, blue or black NASA number printed near the image on the front of the print, but by no means all of them. The unique NASA number for each image can be used to search for further information on NASA's websites. Q. What are the purple stamps on the back of some photographs? A. 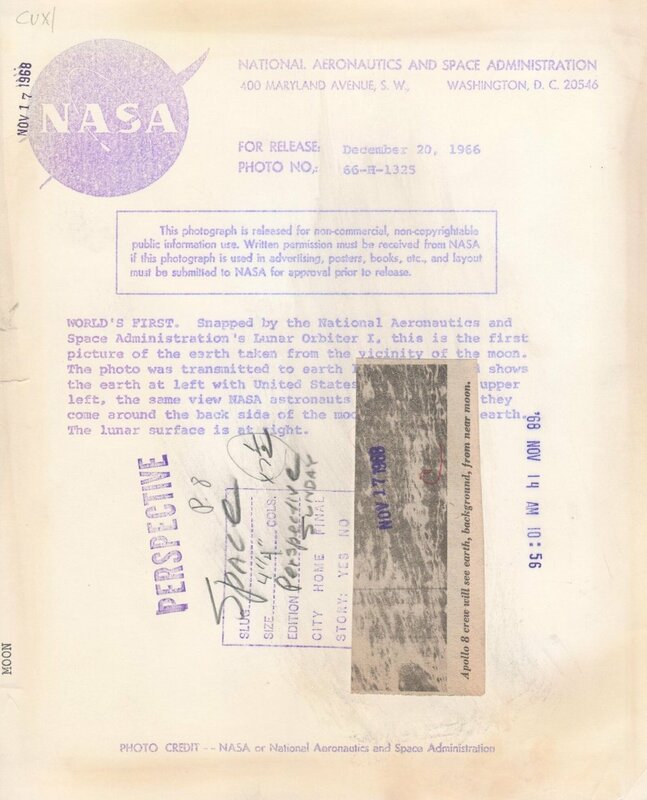 Some, roughly a third, are printed on the reverse in purple ink with the NASA logo, the issuing centre, the identification number (mission-film magazine-frame), the date the picture was taken and an explanatory caption. Colour (chromogenic) prints on heavier weight paper are commonly blank on the back, as were certain print runs made for internal use or for the agency’s subcontracting firms. Q. How should I handle my photograph? A. Always wear surgical latex or white cotton gloves when handling your photograph if removed from the provided archival acetate sleeve. Do not touch the surface of the print, or crease it in any manner as this may damage its value. Keep protected away from all liquids and any staining substances. Do not expose to direct sunlight. Q. How should I care for my photograph? A. All works are purchased 'as seen' and the buyer accepts full liability for any subsequent changes to the photograph's condition. Photographs should be kept out of direct or strong sunlight at all times. If framed, ensure works are behind anti-UV glass and on walls which do not receive any direct sunlight or are brightly illuminated for any part of the day. As vintage photographs, chromogenic prints are sensitive to strong light and may fade if not properly cared for. Q. Can I view an item before I buy it? A. Yes, and it's positively encouraged. Available inventory can be viewed at our gallery premises by appointment. Please contact us to arrange a viewing. Q. Are condition reports available? A. Yes, please contact us to request condition reports for specific items. A. We're always enthusiastic to connect clients with a coveted print and can offer payment in installments, although this is considered on a case-by-case basis following a phone conversation. Please contact us to find out more. A. Absolutely. Please contact us as soon as possible to secure your print and we will issue an electronic invoice. All invoices are strictly payable within 7 days or the item will be made available to other buyers. A. In some cases we offer a discretionary discount of 5 - 10%, depending on the number and price of prints purchased. If you're buying 2 or more items please contact us and we will inform you whether your purchase is eligible. Q. How do you set your prices? A. Our prices generally make sense in relation to the average price for comparable prints sold at recent auctions including buyer's premium (see more information below). While there can be significant variation in the price paid for certain images we endeavour to ensure our prices are reasonable, fair and logical, given the rarity, condition and quality of the print in question. There is also a noticeable discrepancy between the value of highly sought-after iconic images - such as the Apollo 8 'Earthrise', Apollo 11 'Visor' and Apollo 17 'Blue Marble' - and more prosaic, functional images. Please contact us if you have price queries relating to specific prints. Q. When will my photograph arrive? A. Unframed prints will be shipped first class in the UK within 48 hours of receiving your order, and should arrive within 5 business days of placing your order. Framed prints take 4 - 6 weeks to process and ship, depending on our framer's lead time. Shipping times will vary for orders dispatched to Europe and beyond. Please contact us at any time to check on the status of your order. Q. Which auction houses sell vintage NASA photographs? A. There have been three market-defining auctions at Dreweatts and Bloomsbury Auctions in London in 2011, 2012 and 2015. Bonhams in New York also regularly holds sales of vintage NASA photographs and other space exploration items; previous auctions can be found online here. While Skinner Auctions, also in America, recently conducted a landmark sale in November 2017, online here. Q. Will my print hold its value over time? Can I resell it? A. Our prints are priced to hold their value in the medium to long term, and if resold appropriately should maintain their value, less any seller fees or commission. However we offer no guarantees against future sales of works sold by us and do not accept any liability for any future drop of value. Please contact us with any related questions. Q. Where can I get them framed? A. We typically recommend framing NASA prints with our regular framer, using the following specification: 37 x 41 cm profile, 1.5 cm wide at the front, 3 cm deep. Dark stained fine grained wood, floated in a cream window mount with edges visible surrounded by a margin of 3 mm, anti-UV glass (illustrated below). This costs £96 including VAT per photograph, and £140 for large format prints. We can also arrange alternative specifications at your request and work with a number of framing partners at different price points. Please contact us to find out more.